Wpadverts is a free classifieds plugin for WordPress with paid add-ons. At first sight, I thought it wasn’t a powerful plugin. Then, I discovered this plugin is reliable and full of good features. In the end, I consider WPadverts to be the best-classified ad solution for WordPress. It works with all the WP themes, it works on multisite installations. WPadverts is easy to set up. WPadverts have advanced shortcode features. The documentation is really complete. The add-ons are very powerful. No other WordPress classified ad themes on ThemeForest and no classified ad plugins are as good as WPadverts. During registration, A user becomes a WordPress user with the permission to post ads only. It is possible to force users to pay if they want to post an ad. WordPress webmasters can build their classified ad quickly because there is an independent “category” section where you can add advertisement categories (like Cars, Real Estate, Services….) Editing a classified ad is like editing a wordpress post. You can also hide advertiser details behind a contact form to avoid spams. 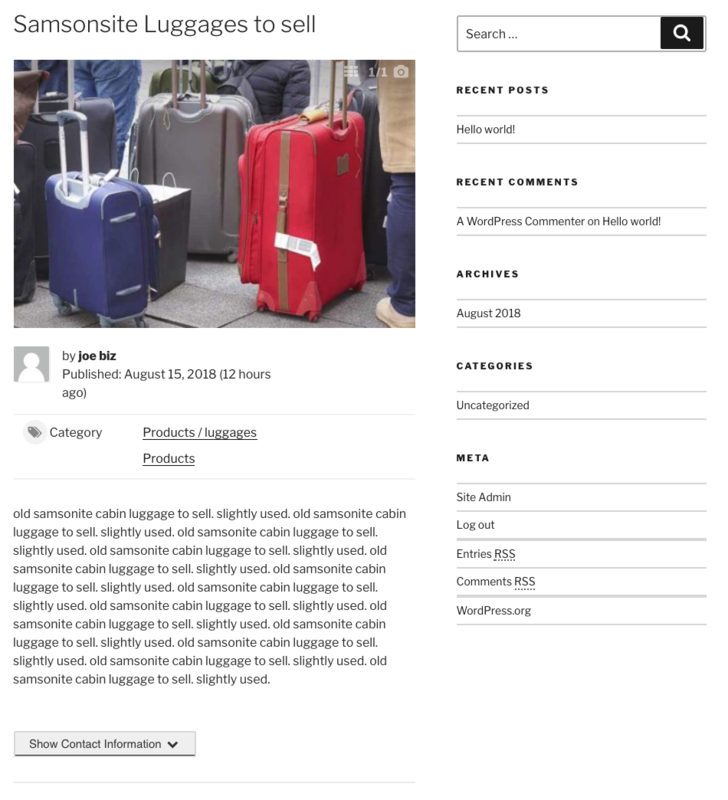 As you can see below, every advertisement possesses the same details as a post ad on craigslist: The user who posted it, the date when it was posted, the category it belongs to, the description below the picture and the contact form below the description of the ad. The blocks for the ads list, ad categories, and ad management are added to a webpage thanks to shortcodes. It is possible to customize the display thanks to parameters inside the shortcodes. Consequently, it is possible to embed classified ads in any pages or posts from your WordPress site. All the blocks are responsive on mobile phones. Wpadverts comes with two widgets. One displays the last posted adverts and another displays the ad categories. Thus, you can add one of those widgets to your sidebar. Also, you can display only the top categories if you want. 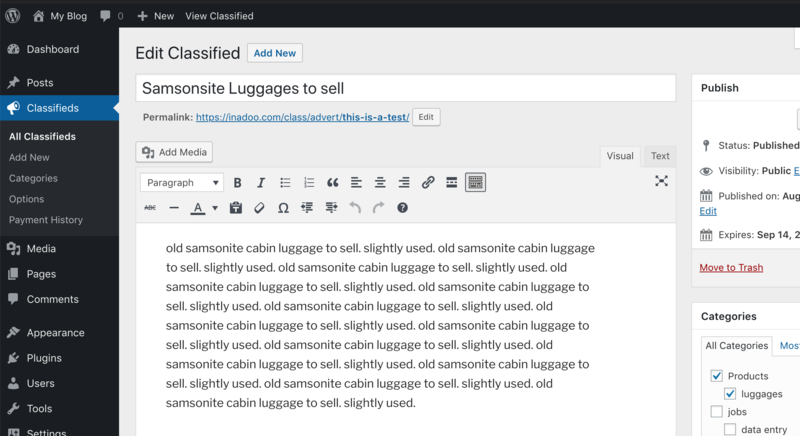 Compared to other classified ad themes and plugins I have tested, WPadverts really focus on the most important: being able to post/modify/delete ads, being able to display a picture with the category and being able to contact the publisher of the ad. All those features seem obvious but there are very important for a classified ad website. WPadverts focuses on the features; not the style. It is very important because many themes look good but they have no features. Woocommerce: take advantage of woocommerce payment gateways to accept bitcoins and local payment methods like Sofort. Send automated confirmation emails and follow-up order. ReCaptcha: to protect your classified ad website from spam bots.